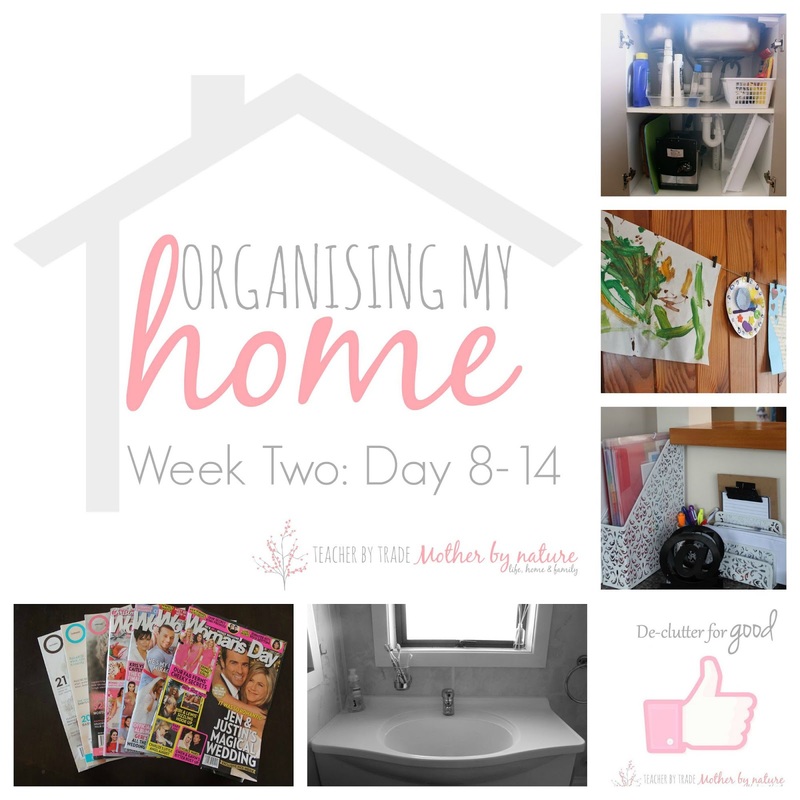 This time last week I started my 'Organising My Home' series - kicking it of with Peter Walsh's amazing #31Days2GetOrganized Challenge and I have completed Week 1 - Woohoo! 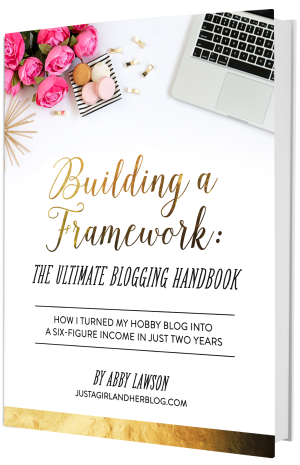 Now if you have just joined us, it's not too late to follow along with the challenge - for more details about this series/challenge, read about it here. Grab ALL your unfolded laundry and put it into one place, now spend 10 minutes folding your laundry! 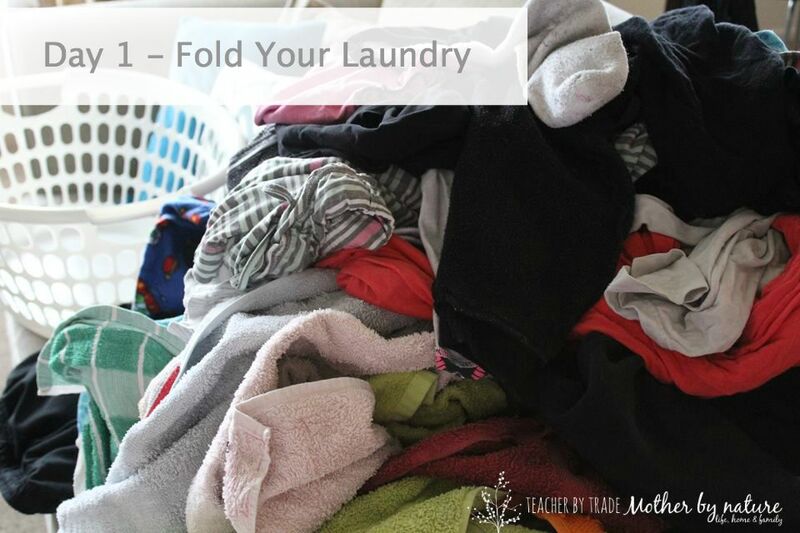 When I am dealing with Mt Foldmore, I like to sort my laundry first: towels/bedding, my clothes, partners clothes and kids, then I start folding...working with smaller piles is a lot easier than attacking Mt Foldmore in one go. So...Grab it, Sort it, Fold it! 10 minutes...Ready? GO! 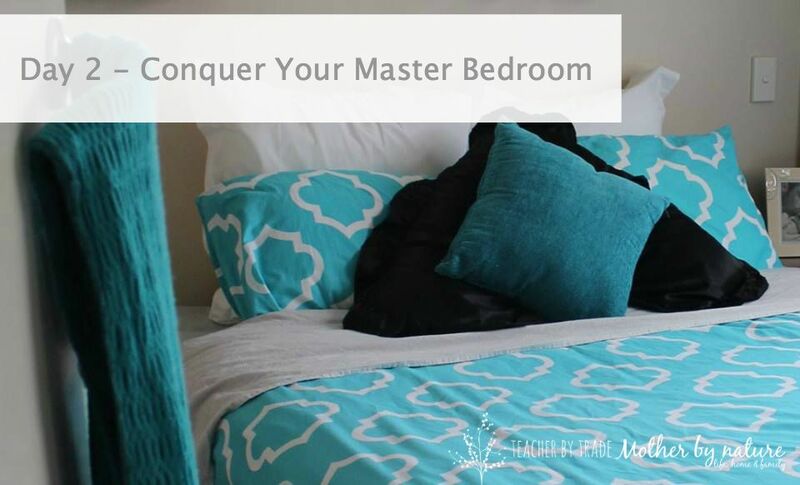 Our Master Bedrooms can easily become a dumping ground, so today, spend ten minutes gathering up and remove anything from YOUR room that doesn’t belong there. Also, have you made your bed today? 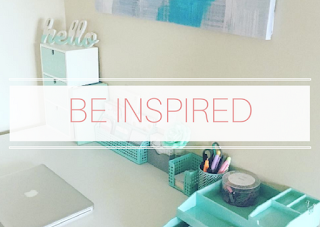 Making your bed every morning can set the tone for your day, plus it makes your room look tidy! What did you find in YOUR master bedroom? Let me know. 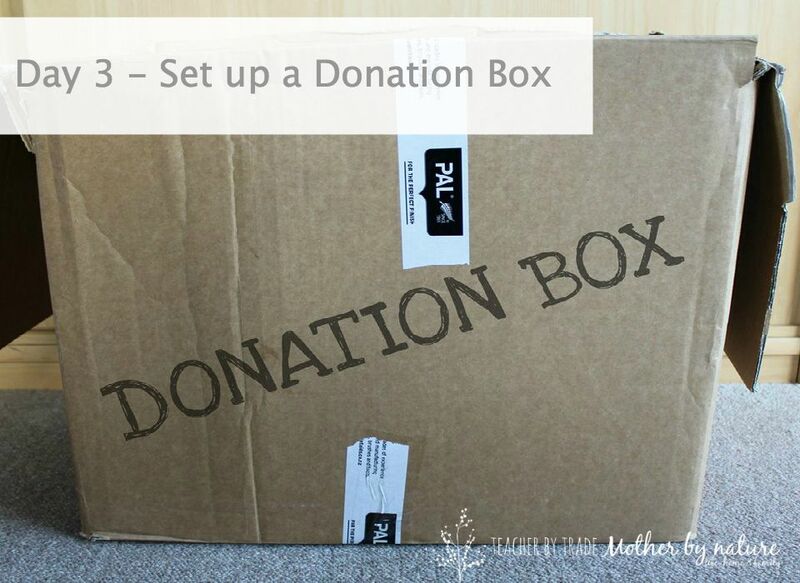 Do you have a donation bin in your home? Putting a washing basket, tub or even a cardboard box in one designated area in your home will encourage you to put things, you no longer need or want, in the box. Once it's full, drop it off to your local op-shop/charity. Todays task is to set one up and throw a few items in just to get started! I have an old tablet case, and a couple of duvet sets to donate. What have you found to donate? 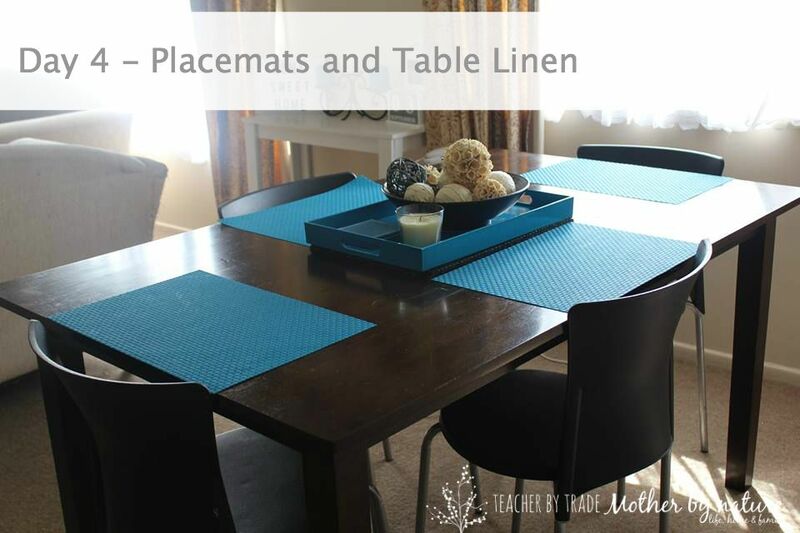 Do you have drawer or cupboard that is overflowing with placemats, tablecloths, napkins etc? Today we are going to sort it out! First, pull everything out, 'sort things into like items', then get rid of anything that you no longer need, use, or want. 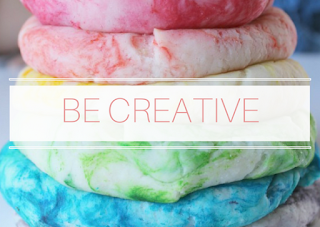 Make sure things are folded neatly and place them back in the area. I keep my placemats on my dining table under our centre tray, and I have another set in a drawer in the kitchen along with a table cloth, for special occasions. Everyone has piles of clothes on their shelves or in their drawers – many that you just don’t wear. Today’s the day to tame them! First, look at your piles of folded items - T-shirts, sweaters, undies, jeans - chances are that the bottom third of the piles are items that you just don’t like that much and seldom wear. 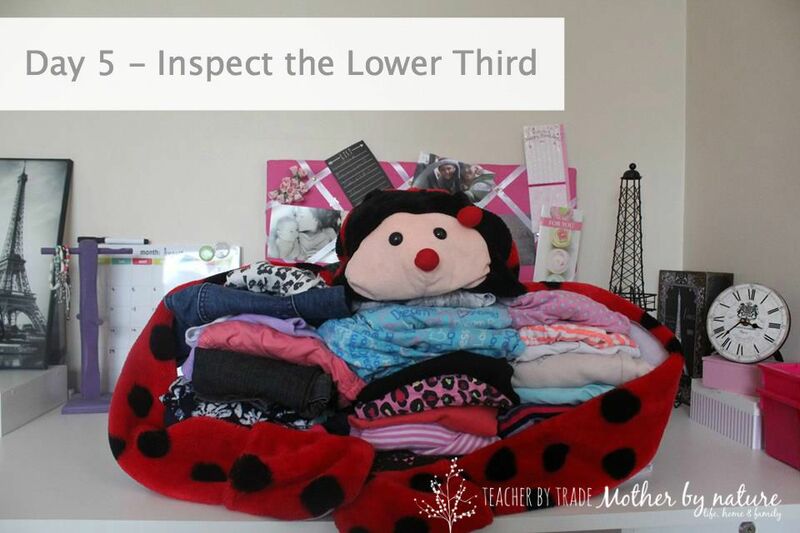 Inspect the lower thirds of clothing stacks – if you don’t love and wear the items then let them go!" Peter Walsh. This is Miss B's pile - it's actually 1/3 of her clothes! Straight in the Donation Box. How many items did you let go? Have you got a stack of 'items' that needs to be sorted, but you keep putting it off till 'later'? That 'later' is NOW! 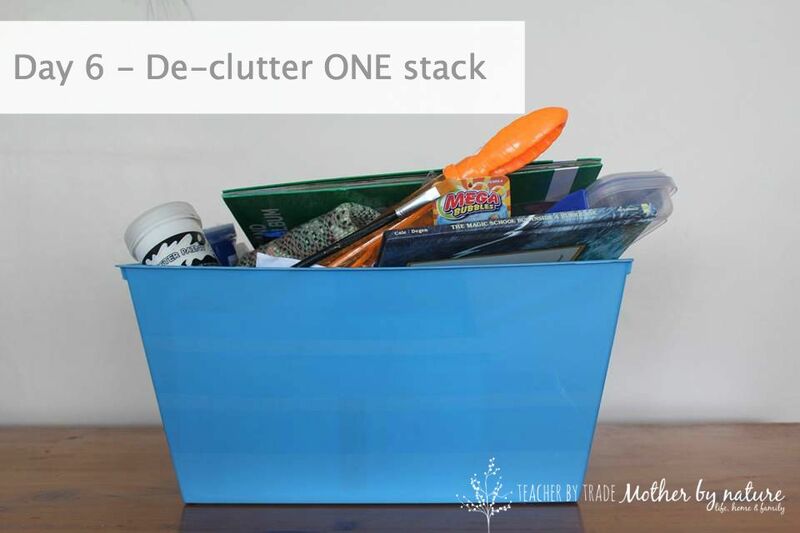 Find a stack, whether it's a stack of miscellaneous items in a basket (like mine), a pile of paperwork (mail) on your kitchen bench or in your office, clothes or books - set the timer for 10 minutes and start de-cluttering that 'stack' - putting things back where they belong, donate or bin. What is the pesky stack that YOU are going to organise today? 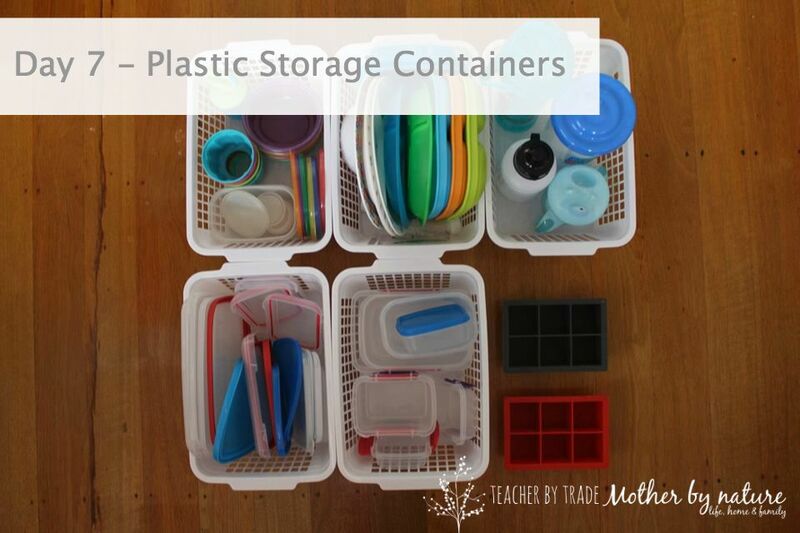 Have you got a cupboard/drawer overflowing with plastic storage containers? Today spend 10 minutes (or more) putting them all on the kitchen bench/dining table. Match containers with lids and get rid of anything that doesn't have a lid, is mangled or stained. Peter's rule of thumb: No more than 15 food storage containers. I organise mine in these inexpensive baskets - it keeps them tidy and it's a lot easier to manage/tidy up if 'little hands' get in there. 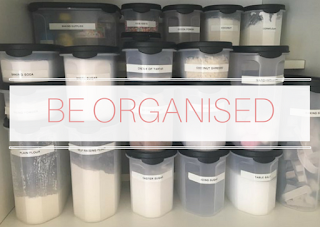 How do you organise YOUR plastics cupboard? 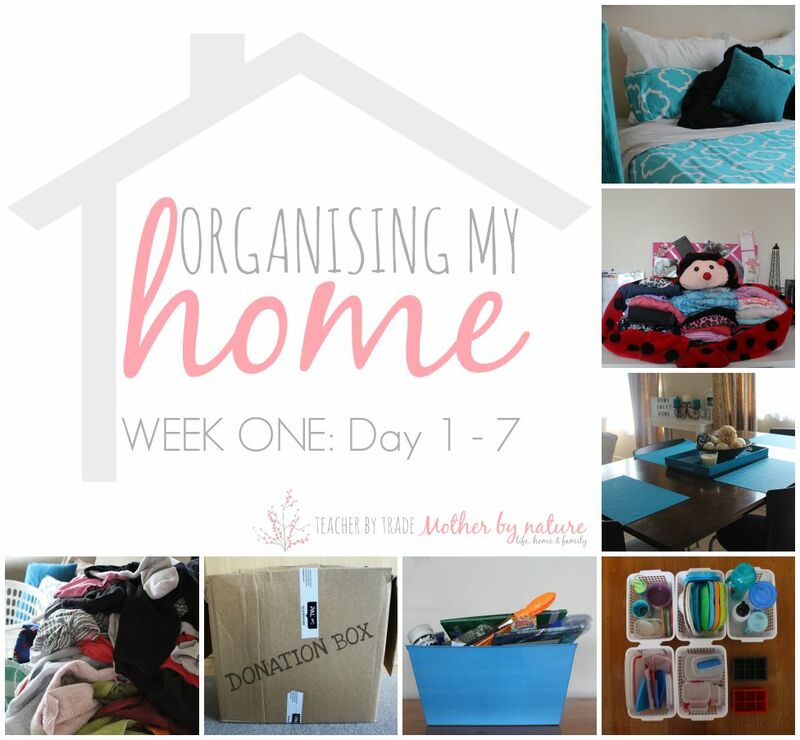 So there you have it...Week 1 - it's not THAT scary organising your home, is it? 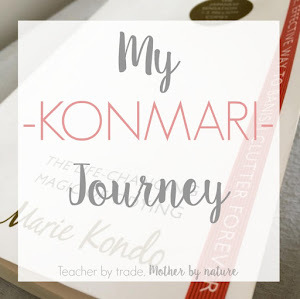 Are you following along with the challenge? How did YOU get on? It really does. Spending as little as 10 minutes on a task can change your whole perspective. I love it. For some reason, I love organising! Such a feeling of satisfaction! Looks like a great challenge! Enjoy! Thanks Erin. 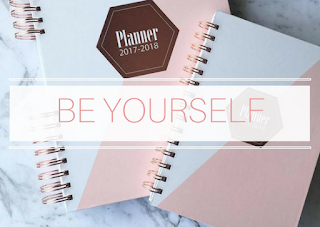 I love organising too! (well obviously). I am loving the challenge so far. 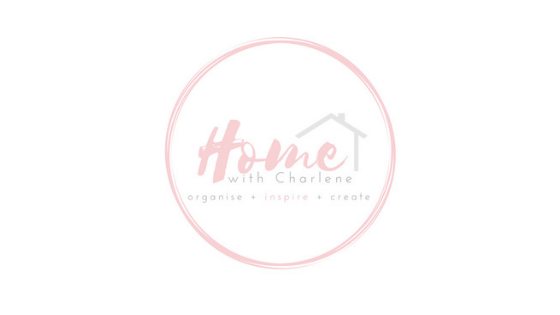 Look forward to sharing more tips and strategies in my "Organising My Home' series. Thank you Bron. I feel so much better when everything has a place. Over the years, I have become more and more obsessed with organising. This challenge and his previous two challenges will definitely smooth out any wrinkles you have in your home Bron. 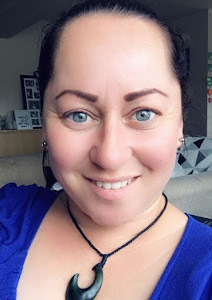 I'm not doing the challenge, but I have been decluttering. I have a huge bunch of clothes ready to donat when I finally get my act together. Awesome work Jess! Well done you. It's so good to declutter, especially clothes! Put them on your passenger's seat and then it will be a quick reminder for you to drop them off! The thing I love about these challenges is you can choose to do the task for 10 minutes only or you can continue until the job is done. It's completely up to you. There probably IS an app for organising your home too! haha that would be cool! Might have to look into that Nicole :) Thanks for stopping by.